For bookings or any other inquiry, contact info@waywardsisters.com. In the luxe bedchambers of Versailles, Louis XIV employed musicians to lull him into and out of sleep. Across the channel in England, the composer and violinist Nicola Matteis died after a long and fruitful career, purportedly from “an excess of pleasure.” Pleasure -and its consequences- ran riot in baroque Europe. 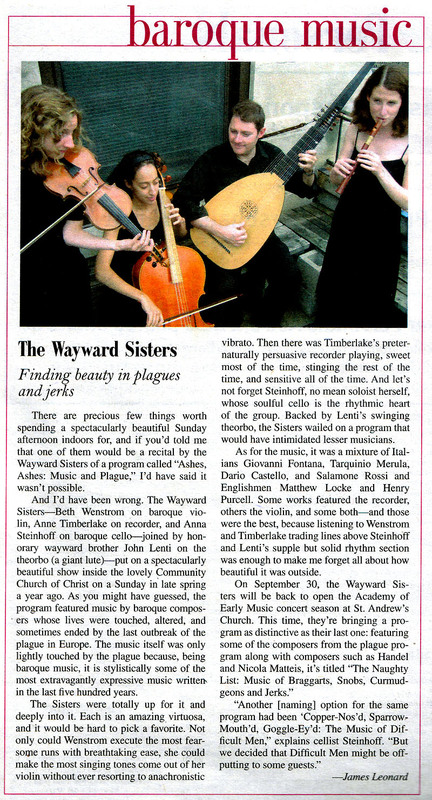 From the unrestrained exuberance of seventeenth-century Italy to the lush aural landscapes of eighteenth-century France, Wayward Sisters wallows -and delights!- in musical excess. Wayward Sisters play Bach, or more to the point, as four sunflowers we turn inexorably towards the brightest light in the musical firmament, so overwhelmed are we that our metaphors mix, and we become one instrument in service to the Father of Music. Hear, in unique, new, original arrangements, the ecstatic mysticism of the organ works, the sunlit genius of the Goldberg Variations, and the geniality of Bach the chamber musician distilled for you as never before! We travel for love, for money, for refuge, for learning, for joy. And baroque composers were no different. A seventeenth-century music maker couldn’t hop on a jet or board a train, but nonetheless, many of the most important composers of the day were on the move. Matthew Locke, Biagio Marini, Francesco Geminiani, James Oswald, Georg Muffat, and even Johann Sebastian Bach undertook journeys of months, years, or decades. Wayward Sisters embarks on an exploration of who we become when we live as strangers in a strange land. Madness can rocket you from bliss to anguish and back. So can music -especially when it goes a little crazy. From the frenzied stamping of the folia, a dance in which young women succumbed to wild “folly,” to the heartbroken howls of operatic heroines, madness set to music can terrify, stir, and delight. Soprano Kathryn Mueller, praised as “a star in the making” by The Albuquerque Journal, joins Wayward Sisters for a dervish whirl through music by Vivaldi, Handel, Purcell, and more. Not all composers are nice guys. Although some, like Henry Purcell, were sociable optimists, others, like Matthew Locke, acquired a menagerie of unflattering adjectives. Disagreeable. Vitriolic. Ill-tempered. Spiteful. Atrabilious. Locke was called all of these things. And Locke was not alone. As interpreted by Wayward Sisters, The Naughty List is a program of music penned by difficult men. Matthew Locke, Tarquinio Merula, William Brade, Nicola Matteis, and even Dario Castello left evidence of both their challenging temperaments and their prodigious musicianship. 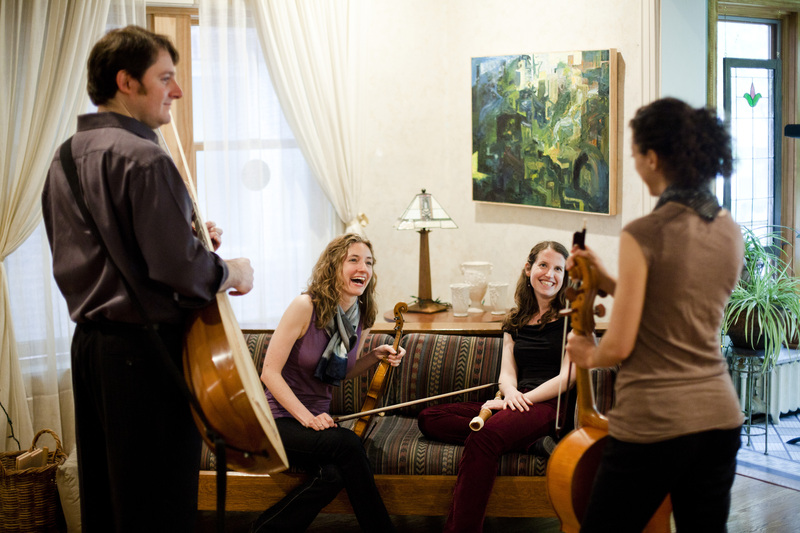 Wayward Sisters explores this intersection, bringing centuries-old composers vividly to life. Although it was no longer known as the Black Death, plague plagued seventeenth-century Europe. It struck everyone: rich, poor, old, and young. And musicians were not exempt- plague snaked through the lives of the finest musicians of the day. Some fled. Some were inspired. And some died. Ashes, Ashes: Music and Plague explores the intersections -some fateful, some incidental- between disease and the creative process. Matthew Locke was thorny, unpredictable, and obsessed with beauty. So is his music. Wayward Sisters dives into the instrumental music of one of the seventeenth century’s genuine mavericks, a man who believed so profoundly in what he thought was right that he dueled -in person and on paper- for most of his life. Along the way we brush up against the music of Locke’s more cheerful contemporaries before returning to dwell on the quicksilver shifts and shimmering textures of the master.